There was an interesting clash of events today. Over at the Orange Studio was the Screen West Midlands/Creative Republic Crunch Time Event. Screen WM’s Sarah Arnesen has a useful report on it – sounds very positive and it certainly had an good choice of keynote in James Medway (update: Ruth Ward has put up the notes from her session). I took a punt on the West Midlands IT Solutions Showcase event over at Millennium Point (having spotted the ad for it on the train of all places – the cross-city line is covered in Business Link ads). I enjoyed it. 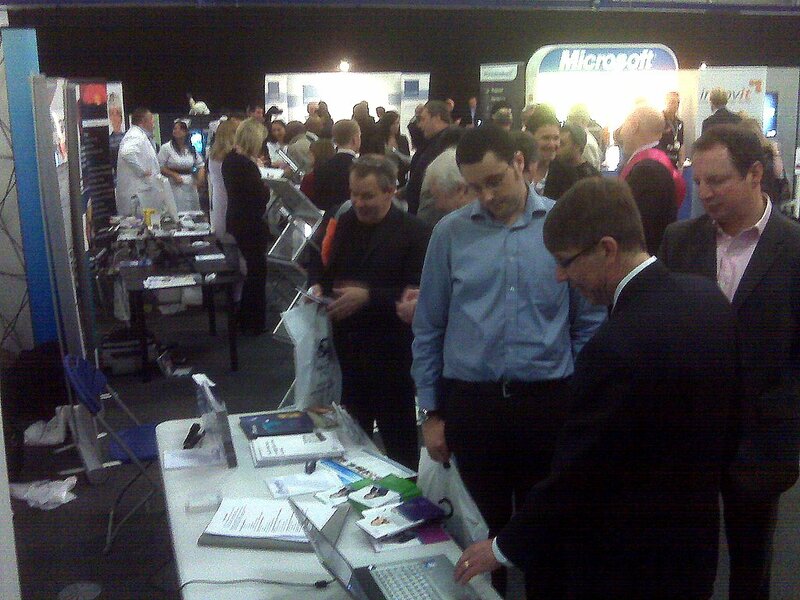 There was a decent amount of stands from both the big boys (Microsoft were there), universities and plenty of SMEs. 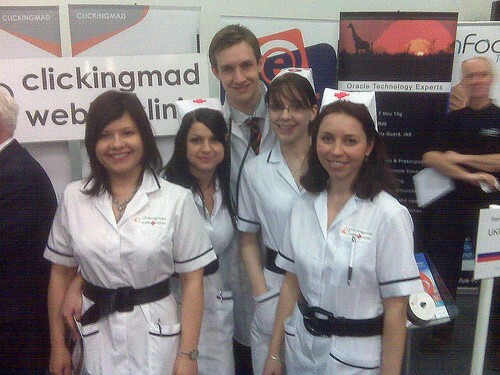 The team of doctors and nurses above were from Clicking Mad. Gimmicky maybe but they were there to sell services and in a room full of suits they stood out a treat. I chatted a little to Alexis (to the right of the doctor in the pic) who was keen to tell me all about the company and it was pleasing to here that business seems to be holding up well despite the tough times. So the event was refreshingly can-do. It’s linked to the launch of a new advisory service on IT from Business Link (more to come on that I think) and the place was SWARMING with Business Link people. Easily 30, maybe more. Uptake of IT by businesses in the region is apparently amongst the lowest in the UK (so we learnt from a presidential-style TV address by Business Link West Midlands’ chief exec), presumably that’s the case for investment and for the scale of the event. I’d be eager to hear more about the Crunch time event but it’s safe to say that over in the IT Solutions world we had a small army of business advisors, some nurses, and crucially, punters-a-plenty. I have a feeling that whether you think of yourself as IT, Creative, Digital or whatever, today maybe you needed to be in two places at once. This entry was posted in Business and tagged Advantage West Midlands, business link, Creative Industries, icentrum, IT, it-futures, millennium point, thinktank. Bookmark the permalink. More BBC drama for Brum?